Before his return to Pakistan, Nawaz Sharif met his ailing wife at London hospital. The picture of the emotional moment is doing rounds on the internet. According to reports, Nawaz Sharif and his daughter Maryam, who were sentenced to 10 and 7 years in jail by an anti-corruption court in Pakistan, are expected to be arrested after their arrival at Lahore airport. 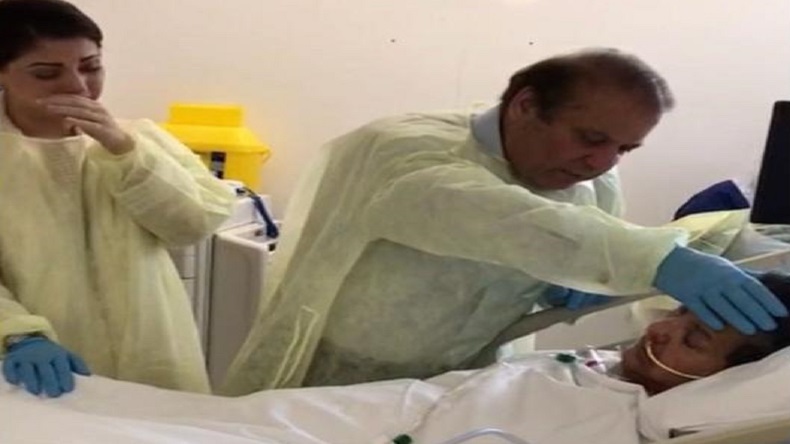 Former Pakistan Prime Minister Nawaz Sharif’s emotional picture with his ailing wife Begum Kulsoom and daughter Maryam is doing rounds on the internet. In the picture that is being widely shared by users on Twitter, Nawaz Sharif is keeping hands on his wife’s head and Maryam is breaking down into tears. The picture has attracted emotional response from social media users, praying for Sharif’s wife a speedy recovery. The picture was taken before the father-daughter duo left the London’s Harley Street Clinic for Pakistan. The picture was also retweeted by Maryam Nawaz. Days ago, an anti-corruption court in Pakistan sentenced Pakistan Muslim League (Nawaz) leader Nawaz Sharif and his daughter to 10 and 7 years in jail respectively in the Avenfield corruption case. Reacting on the picture, a Twitter user said that it will be marked as the ugliest face of Pakistani Establishment. According to reports, Nawaz Sharif and his daughter Maryam are expected to be arrested after their arrival in Lahore. Former Prime Minister Nawaz Sharif, speaking to media at Dubai airport, said that he is going to take his struggle forward. The father-daughter duo is expected to board a flight to Pakistan with a National Accountability Bureau (NAB) team onboard. The local authorities have prepared themselves to avoid chaos when Nawaz Sharif will come back to his country. The local police have arrested around 300 PML(N) workers who were reportedly supposed to welcome Nawaz Sharif and his daughter at Lahore airport. As a preventive measure, authorities have decided to close down all national highways and motorways ahead of the arrival of the father-daughter duo from London.